These pictures have not been digitally altered or enhanced. This is a 'before' picture of my chest area. As you can see its extremely patchy. I've not been in the sun for over 10 years so the colour of my pigmented skin is at its lightest. This is an 'after' picture having used the 'Medium' shade of VITILIGLOW spray. As you can see it has helped to blend in my patches of de-pigmented skin. 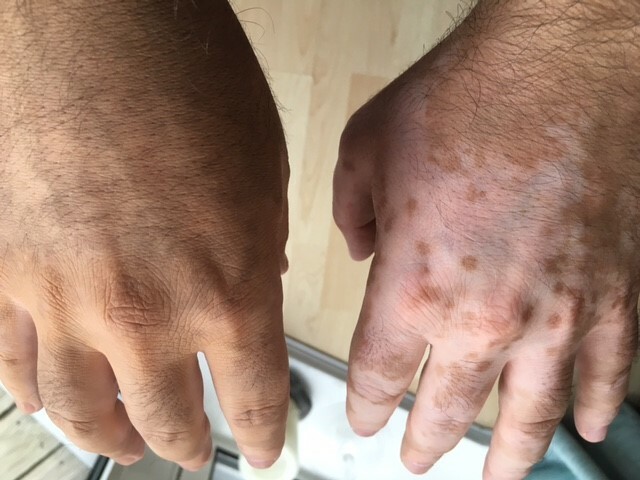 My hands are completely de-pigmented and I have white patches on the inside of my elbow area. I've used the 'Medium' shade and sprayed my hand blending up towards the wrist area. I then sprayed the white patch on the inside of my arm blending towards my wrist. I have patches around my armpit area and on my hips. I sprayed the 'Medium' shade around the armpit area and blended it towards my ribs. I then sprayed my hip area blending upwards to wards my ribs. You can see that the white patches on her legs are now nicely blended in with her skin tone. with it that she wanted to share she results she achieved using the product. This is a 'before' picture of a customer's hand. She has a de-pigmented skin on the back of her hand. Her skin natural skin colour is warm beige and she used the 'tan' shade of VITILIGLOW spray. This is the 'after' picture and shows the natural results she achieved using the 'tan' shade of spray. which is a warm beige. This is the 'after' picture of her hand having used the 'tan' shade to blend in her de-pigmented skin to her 'tan' coloured natural skin. of de-pigmented skin on the inside of her wrist. This is the 'after' picture of her arm after she has used the 'tan' shade of Vitliglow spray to blend in both patches. These are the actual results that can be achieved quickly without having to use a primer, colour or setting powder. Vitiliglow is an all in one product. These pictures were sent in by a customer who had used the 'light' shade of Vitiliglow - she was delighted with the result as it stopped her skin looking uneven.